Rev. Franklin Graham has spoken out about former mayor Rudy Giuliani's comments questioning President Barack Obama's love for America. 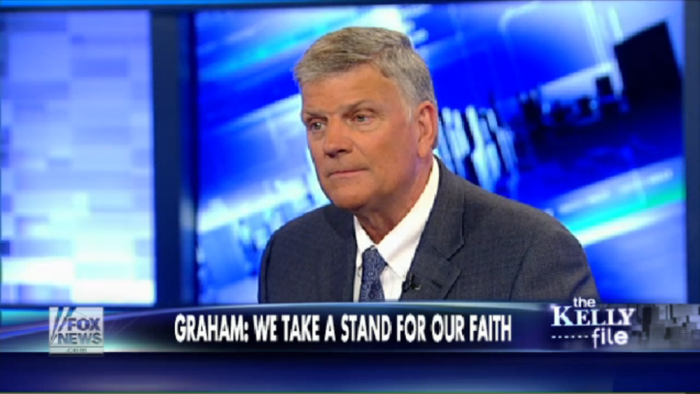 Graham said that the country is "morally crumbling within" and has turned its back on God. "Former New York Mayor Rudy Giuliani has taken a lot of heat from the media for his remark that he's not sure if President Obama really loves America. I don't know if that's true or not," Graham posted on Facebook, "but I do know that the president defends Islam and chastises Christians, rebukes our allies and befriends our enemies, and fully supports gay marriage and abortion but denies the religious freedoms of those who don't agree." Giuliani found himself at the center of a national debate after stating that he wasn't sure whether Obama loved America but later apologized for questioning Obama's intentions and heart. "Obviously, I cannot read President Obama's mind or heart, and to the extent that my words suggested otherwise, it was not my intention … I bear him no ill will, and in fact I think that his personal journey is inspiring and a testament to much of what makes this country great," Giuliani wrote in an op-ed for The Wall Street Journal. These words came after an appearance on "The Kelly File," where he adamantly defended his critique of Obama. "The reality is, from all that I can see of this president, all that I've heard of him, he apologizes for America, he criticizes America. This is an American president I've never seen before," Giuliani told host Megyn Kelly. Graham noted these words, seemingly supported them, then went on to add that America is "ridiculed abroad and morally crumbling within. We are in trouble. We have turned our back on God." His post has been well received by followers and shared over 55,000 times, with fans giving the post over 140,000 "likes" on Facebook. Meanwhile, White House Press Secretary Josh Earnest commented on Giuliani's remarks on Feb. 20, stating that it was "sad to see when somebody who has attained a certain level of public stature and even admiration tarnishes that legacy so thoroughly."